A late evening walk after a soft rain. Gianni accompanied us so we could all catch up with the events of the season we had spent in France. Suddenly he leaped over the edge to grab some flowers. 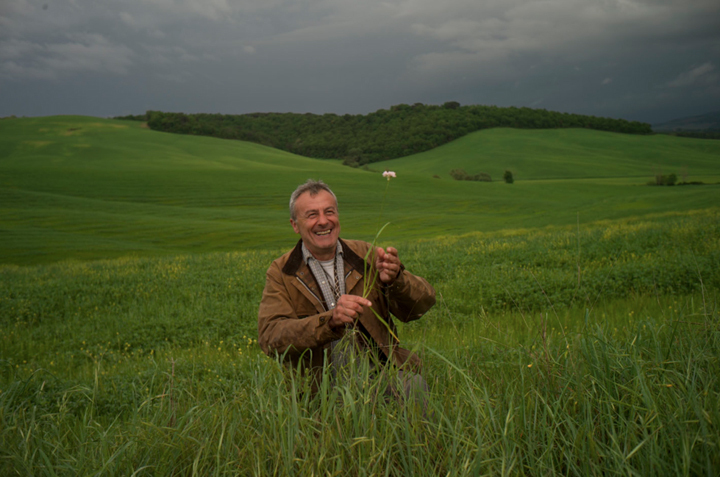 His spirit, and the joy he takes in everything, reminded me of why we love Tuscany so much. It’s not only nature that calls to us, but a friendship with a man of this land whose connection to it is so natural and deep that it has added a respect for all things Tuscan to our way of thinking. And out of that has come a kind of image making that is open and relaxed and about daily pleasure. And so portraits and gestures, and landscapes, and still lives, and the simplest of daily comings and goings mark my days. Everything seems photographable. This entry was posted in Tuscany and tagged evening, Gianni, Landscape, Maggie, Tuscany on May 6, 2015 by joelmeyerowitz2014.